Durst offers a separate packaging workflow system for the Delta Series. The comprehensive solution covers all processes from data management and print data preparation to output on the printer and reporting. Access to the software is browser-based and can also be managed from mobile devices without any additional installations. 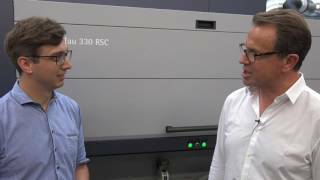 The Durst Workflow system can be extended at any time with a range of modules for variable data printing, ink consumption calculation, high-speed RIP, grid charts & color book compilation, operating several printers at the same time and much more. The Durst Concerto communication server permits the integration of external MIS/ERP systems as well as web-to-print portals. The job data and information is managed on a speciﬁc basis. The job status can be viewed at all times for user groups. Interfaces are deﬁned between customer support, media designers, media technologists and controlling. The print data with all relaevant information is ready for production right after preﬂight mode. The print data is displayed clearly and in a modern manner in the browser window. The standard correction of the ﬁle can be done direct in the browser window without any extra software applications. An Adobe Illustrator plug-in is available for simple data preparation as well as extentions in special applications. The variable data printing (texts, numbering, images and bar codes) can be carried out directly via the browser or via Adobe Illustrator. Ink cost calculations can be made right from the ﬁrst minute. True-color measurement values are available for special colors based on the different medias. (∆E76/∆E00). Ink consumption can be optimized through different proﬁles (Economy, Standard or Best Match). Control and plotting data for later production processes can be easy created and transferred. All process steps are documented and can be retrieved and repeated at any time. 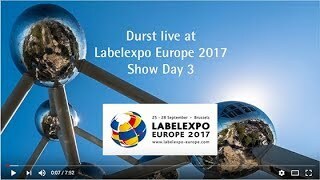 See what was happening at the Durst Booth during Show Day 3 – See the video that gives many impressions and it includes an interview with Robert McJury from TLF International sharing her experience about how UV inkjet label printing has contributed to her business. 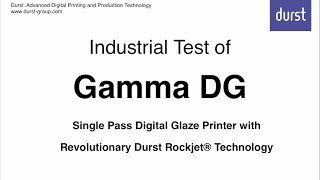 Currently under industrial test with first installations in the second half of 2018, the Durst Digital Glaze Printing technology is the end result of over 6 years of research and development efforts aimed at creating a complete glazing line capable of integrating a fully digital process based on an open system. The solution incorporates latest-generation Durst glazing, printing and finishing technologies and can work with glazes that are very similar to conventional products. The resultant line will guarantee maximum versatility, flexibility and quality, as well as extremely competitive management costs, space rationalisation, optimisation of production and a high degree of management control through process automation. Brixen, Italy – September 8, 2017 – Durst, manufacturer of advanced digital printing and production technology, has received the coveted GOTS certification in version 5.0 for its new reactive ink system Alpha Ink R HD. The Global Organic Textile Standard (GOTS) is the most exacting seal of approval for the entire textile production chain and is also acknowledged by consumers to be a reliable quality standard. Introduced in March 2017, version 5.0 of the standard must be implemented within twelve months by textile manufacturers in the areas of bio-production, textile processing and textile chemistry; it has further tightened the environment criteria right along the whole supply chain. The new guidelines refer to clothing and other textile products consisting of at least 70% certified organic fibers. All used chemicals including dyes and auxiliary substances must fulfill stipulated criteria in terms of environment and toxicology. Textiles produced according to the GOTS 5.0 guidelines give consumers the necessary transparency that these are sustainable products, which were also made under socially acceptable conditions. Durst is one of the first inkjet printing system manufacturers to offer a GOTS 5.0 certified reactive ink system for the digital production of home textiles, clothing, accessories and furniture upholstery. The newly formulated Alpha Ink R HD reduces ink consumption by approx. 30% compared to Durst's existing reactive ink system. "Following the market success of our soft pigment ink system Alpha Ink P for sustainable, economic production based on universal applicability and a one-step process without pre- and post-treatment, we are now taking another step forward with GOTS 5.0 certification for the classic cotton production", says Martin Winkler, Segment Manager Durst Textile Printing. "Durst's Alpha Series and our excellent inks offer a perfect eco-system for digital textile production." Brixen, Italy - 17/07/2017 - Durst, manufacturer of advanced digital production technologies, will be presenting its latest development, the new digital - high resolution - high speed - 8 color label press Tau 330 RSC inline with OMET’s Xflex X6 hybrid solution as well as its new Web2Print workflow at Labelexpo 2017 in Brussels, from 25–28 September 2017 at the Durst Booth 8B26 in Hall 8. The new Tau 330 RSC is a UV inkjet label and package printing press featuring 330 mm (13 in.) print width combined with leading edge print speed of up to 78 linear meters/min (245 ft./min) at 1200 x 1200 dpi printing resolutions. 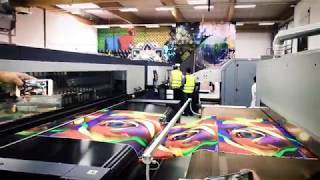 The press achieves a production capacity of 1.485 m² per hour, and thanks to its 8 color stations (CMYK+W+OVG) with new designed high pigmented inks it delivers outstanding, flexo look-like print quality with close to 98% pantone color gamut coverage. In line with Durst’s customer claim “Configure Your Digital Future”, the completely new Tau 330 RSC is available as stand-alone version or can be combined with in-line digital laser die cutting LFS 330. At Labelexpo, the Tau 330 RSC will be be configured as “hybrid press” with OMET’s Xflex series of conventional finishing options, providing unlimited material flexibility for a vast range of applications. Its configuration options include jumbo unwinder and material pre-treatment options like inline corona, web cleaner, priming as well as post press finishing options like varnishing, cold foil, lamination, die-cutting, slitting and rewinding. Also showcased will be the flagship Tau 330 with Low Migration ink for primary food & pharma packaging as well as the economic entry model Tau 330E with its specially developed high pigmented UV inkjet inks. The press will be demonstrated as a complete solution with the EFS 330, an equally economic converting & finishing system from SMAG. Together with the Tau 330 series, Durst will also introduce its new Web2Print solution for online design, preview and ordering of all kinds of packaging products like labels, folding carton, and more. Also on display will be Durst’s own Workflow-Label Application Suite, a modular, expandable prepress software for order entry, pre-press, RIP, color management, ink-costing and production data management. Visitors will have the unique opportunity to see full live demonstrations of the entire digital production workflow from online ordering, data processing, digital printing and finishing.